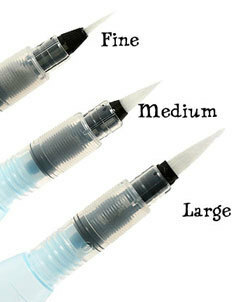 We also stock Jane’s own Aqua Brush, and her new INK Brush! 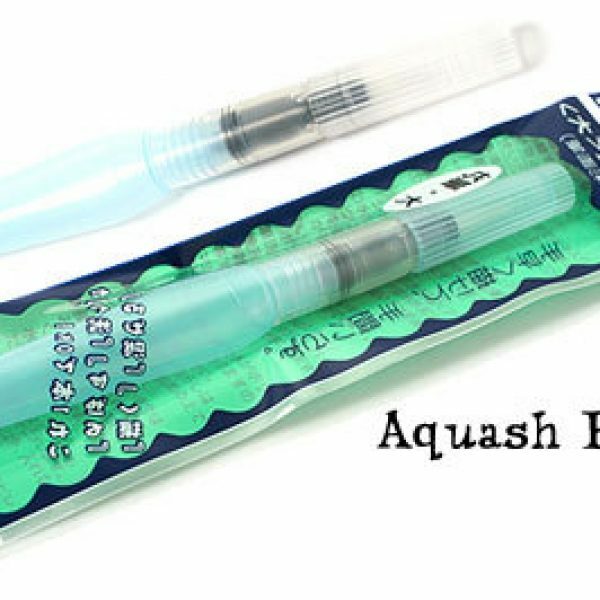 SKU: Aquash. 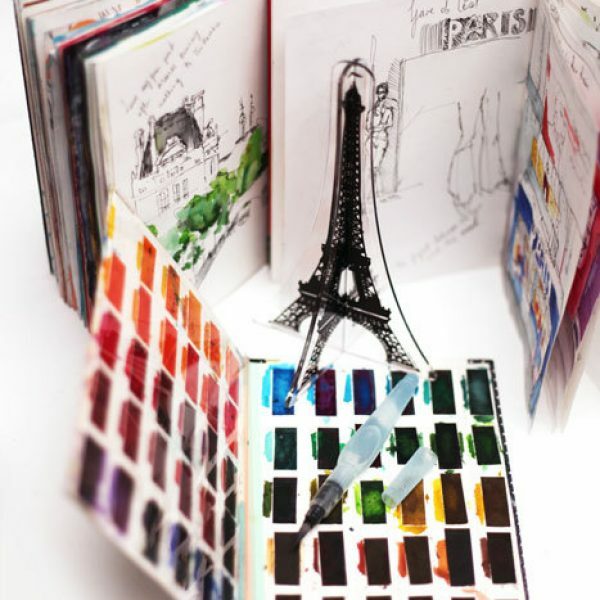 Categories: Supplies, Ink, Paintbrushes, Watercolour. 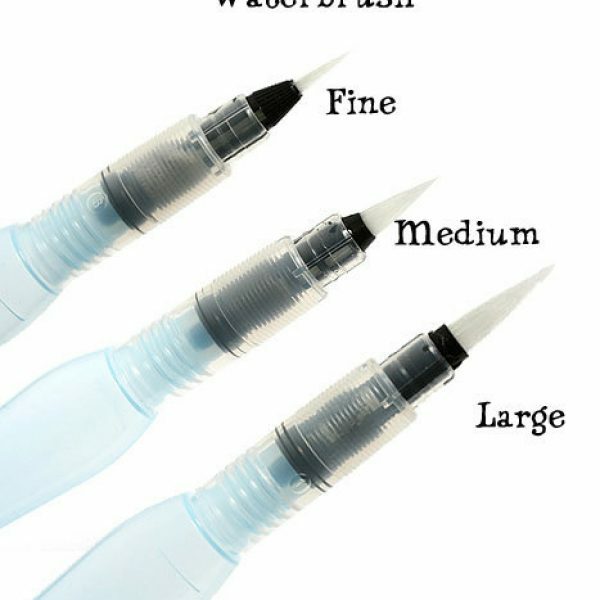 Waterbrushes are a fairly new invention from Japan that have quickly gained popularity all around the world. There is a lot of potential in these brushes, as they eliminate the tools normally needed for watercolor paintings. 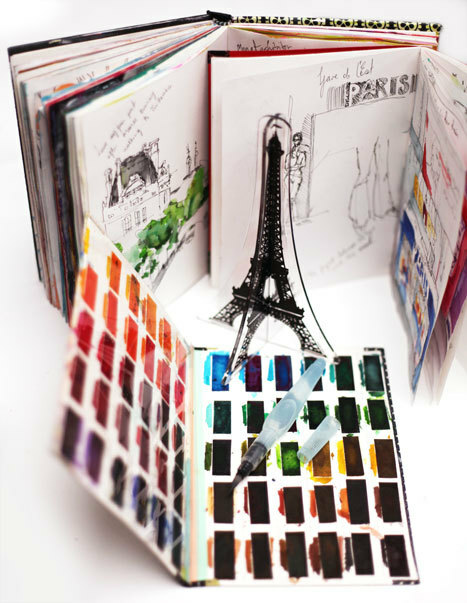 They are also extremely portable, allowing you to paint on the move. Aquash is simple to use. Just create a sketch in any watersoluble media (eg: watercolour pencils, NeoArt crayons, brush markers, Portfolio oil pastels etc), and then use the Aquash brush to blend the lines and colors. 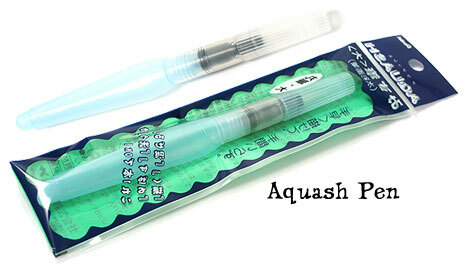 Or, you can apply the Aquash brush directly to the crayons or pencils and use them like paint. 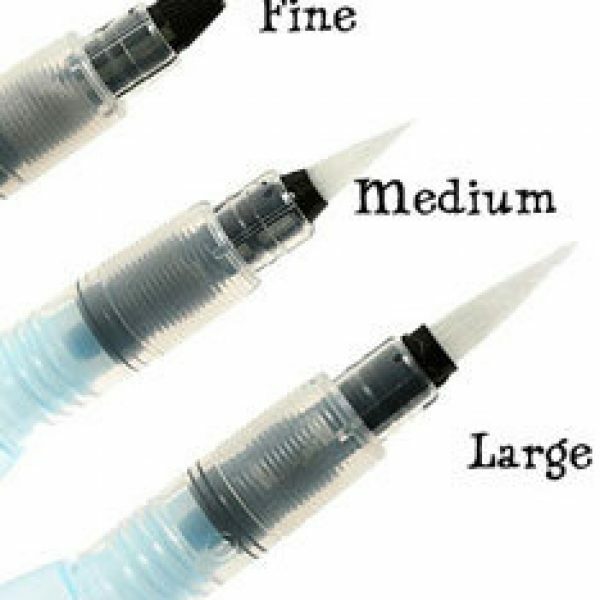 You can also fill them with any really fluid ink! See the video for more ideas…. I love, love love these convenient tools and keep on coming up with more things to fill them with. 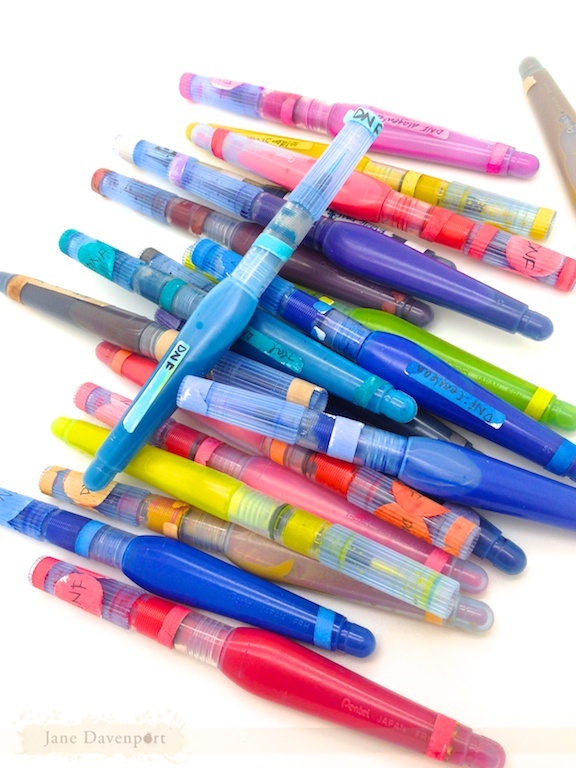 This image shows the loaded Aquash I have in my pencil case – they are filled with Dye-na-flow ink (which is heaven!). 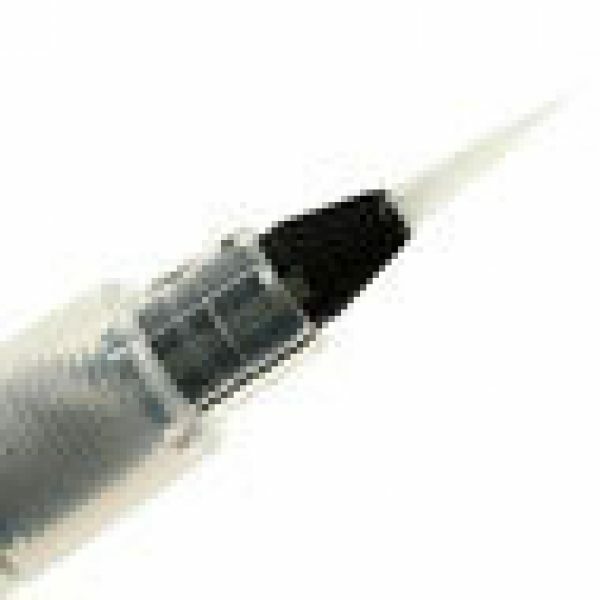 With a tool as convenient as the Aquash, more than one brush is ideal…! The brush is very easy to clean, just squeeze out some water and brush it on a tissue. If it is loaded with ink, you don’t need to clean it of course! 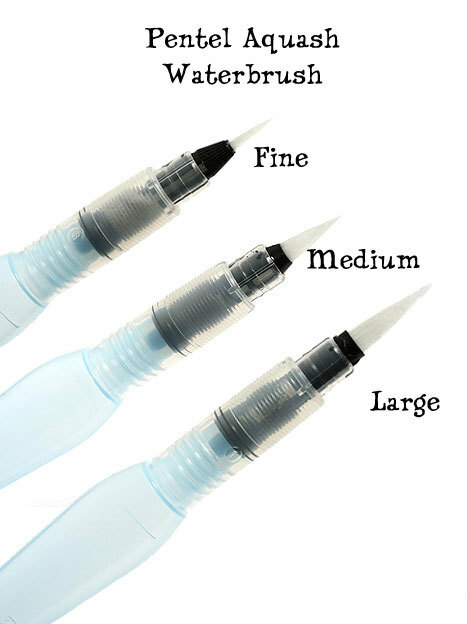 If you want more detail in your artwork try the fine Aquash brush or for fuller coverage try the Aquash large sized brush, but I suggest getting all three as they will be one of the most versatile tools in your kit!The brush hairs are tough, made in a soft plastic. They have great flow and you can gently squeeze the handle to increase waterflow if you want to.